For Copenhagenize the Velo-City conference in Copenhagen was a whirlwhind of meeting wonderful people/colleagues from all over the planet. 'Networking' is far too dull a word for it and doesn't do it justice. 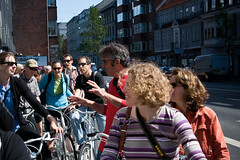 The League of American Bicyclists collaborated with Copenhagenize Consulting on a series of bicycle tours before and during the conference. 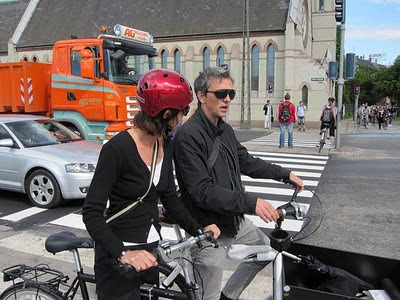 Bike rides around the city to see the infrastructure highlights in the Danish capital. We, in turn, enlisted the help of Biomega and Baisikeli to provide the bikes. One of the tours was with New York's Dept of Tranport Commissioner Janette Sadikh-Khan and her crew. I was impressed to hear that the New Yorkers all took time out of their annual holiday leave to come to Copenhagen for the conference. What commitment. 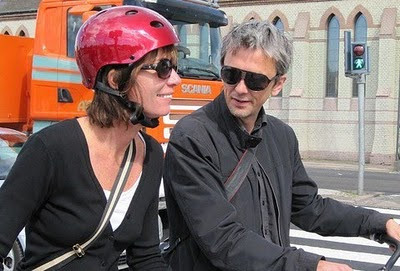 Another tour with the League and Copenhagenize was a ride to show John Burke, the president of American bike company Trek, around the city, along with some other Americans. 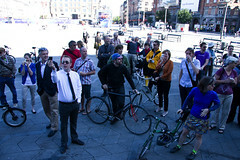 Andrew, City Councillor from Dublin and Ciaran, Dublin's Cycling Officer came along as well, as an extension of our conversations in Dublin the week before. 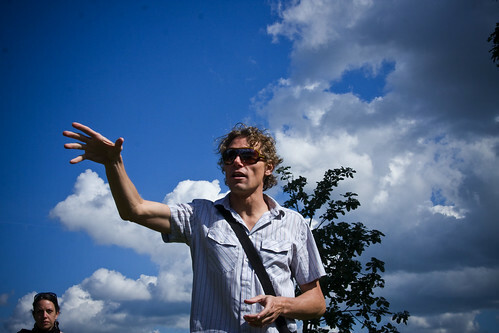 As it was explained to me, John Burke is one of the most important bicycle advocates in the States. He's also a lovely, down to earth guy. 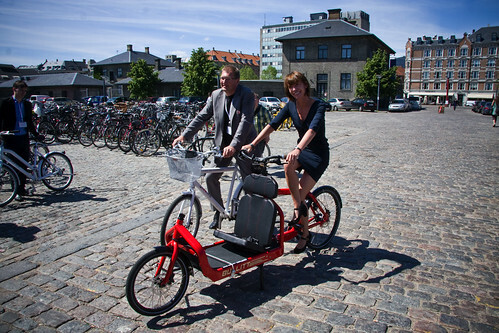 After their keynote speeches, the mayor in charge of the Technical & Environmental Adminstration, Bo Asmus Kjeldgaard, posed for a photo op with Janette Sadikh-Khan outside the Velo-City venue. The Danes, when speaking amongst themselves, affectionately referred to her as Chaka Khan. I suppose the name was tricky to remember, but she also rocked the stage in her keynote speech. If it was Sadikhansen, perhaps it would be eaiser to remember. Here they are on the mayor's offical bicycle, complete with his name, from Biomega and Chaka Khan on my shiny, new and very red Bullitt cargo bike. On the morning before the conference started, The League and I took a large group of American delegates on a two-hour tour of the city. We met up on the City Hall Square bright and early. 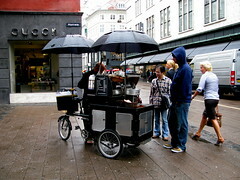 Espresso man Ole served up coffee from his coffee bike for the jetlagged before departure. I was fearing a logistical nightmare of riding through the city in the rush-hour with 40 guests in tow but to my amazement it went smoothly and we arrived at the conference on time. I enlisted the help of Niels, from the city's Bicycle Office, to help out with answering questions and highlighting the Bicycle Office's work. We all stopped at the American Embassy to meet the American Ambassador, Laurie S. Fulton, who came out to greet her countrymen and women and to wish them luck with their advocacy work.